Losing someone you love isn’t easy. Whether you are moving on from a relationship or letting go of a dear one that has passed, healing that part of your heart takes time and puts us in a place that can feel surreal compared to the everyday situations occurring around us. Be sure to allow yourself the time to heal, face what is there, so that part of you can be open to what awaits in the future. Commission piece for the treatment room at The Sacred Spiral Academy. I had the honour of creating something for this special space and my only guidance was to make it with an Egyptian touch. Amazingly the colors I chose and the initial sketch were exactly what they had wanted, without even communicating. Divine guidance at play on this one and it’s felt. I was able to view it in it’s new home in person at the open house on Halloween, which gave me a chance to dress appropriately! She is our soul incarnated through the ages, always remembering, glowing white with it’s purity. We are but an experience through her eyes. Acrylic on finished canvas. That isn't smoke, but rather her essence emanating from within. Both dark and light come forth. Not positive or negative- What is. Realism added to an abstract background- bold and bright, making it an excellent focal piece for any space. Acrylic on finished canvas. Aqua blue and grey tones with a brown shadowed figure in the foreground. Second of the series. Whatever my exterior experiences, whether it be gentle waves or a crashing storm, like the depths of the ocean there is always a sense of calm deep below. Acrylic on finished canvas. Blue and green tones with a black shadowed figure in the foreground. First of the series. 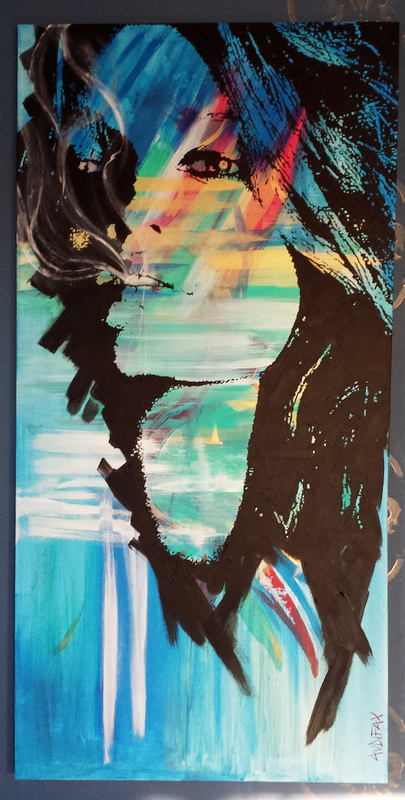 Spray & acrylic on canvas. A ghost hand holds a solid sprout. Human survival- dependent upon our willingness to care for the very species that supports us. the abstract background, with a stoic face looking ahead in black. Acrylic on tea stained linen - Complete with dowels and feather detail. This painting feels like she was lost in a forest. Though her surroundings were vibrant, something was missing. After so much searching, this is the moment she is finally found by her higher self/inner light. Wherever she is, from this moment forward is "home." A series inspiring us to live our passion. This series of paintings is a motivation, a reminder that each of us has a completely different pair of wings (which is why each painting is so different) – a purpose that only we truly know, our personal gift to share with the world. This spark is there when we are born, that instinctual motivation that drives, inspires, and makes us feel complete. Over time, societal influences begin to creep in and we lose that sense of why we are here; we forget our purpose deep within our hearts. If one of these paintings speaks to you it is a message specifically for you to open your heart and listen to it’s call.